Would like to know how your Endoscopy Lab stores their Savory Dilators. Recent Joint Commission Surveys have cited facilities for storing them flat in the carrying case. Reason: 1. Should hang vertical to allow draining/drying of wire channel 2. Lack of sanitization of the carrying case. Are any of your labs storing vertically? If so, by what means? Also, traceability: Do you keep a reprocessing tag on each dilator and place in the patient record like your endoscopes? Need ideas/suggestions! Thanks for your responses!!!! Initial insertion of PEG tube: sterile or clean procedure?? Can anyone direct me to literature that states whether sterile or just clean technique should be used during endoscopic pull through PEG tube insertion? I have checked the Endovine package insert, SGNA, AORN(on line search), ASGE practice guidelines, Association of Professionals in Infection Control and a general google search and I cannot find any verbage specifying which should be used. Please Help! Initial insertion of PEG tube: sterile or clean procdure?? I agree. Yes, I will ask her to do that! Thanks! Yes, I definitely have some of those personality types in the department. I guess when I start the position (in the near future), when it is announced, I will tell them collectively that my job is to educate and remediate but also let them know what the Director expects me to report. I will just have to remember what you said about having a thick skin when certain nurses accuse me of "picking" on them. Thanks so much for the advice and encouragement! Yes, we are encouraged to do self reporting of errors and most do but there are a couple that feel like the Director "doesn't like them" and fear being reprimanded. These are the same ones who have repeated mistakes. 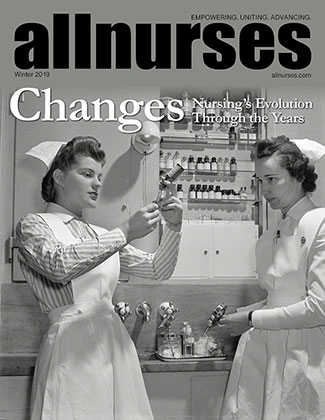 They accuse the charge nurses of "picking" on them and not reporting everyone who makes errors. Like you say, my best bet is to talk to the Director about her expectations of me in this situation and stick to policy. Thanks so much for the response/advice! Have any of you had experience with the Ambu Ascope3 Disposable Bronchoscopes? Our Respiratory Department is looking at this as an alternative to the pulmonologist calling us in during the night. This is the link : [COLOR=#0000ff]http://www.ambuusa.com/usa/products/clinical_studies/ambu%C2%AE_ascope.aspx[/COLOR] They are reportedly around $300.00 each and the monitor/software that goes with it around $2,500.